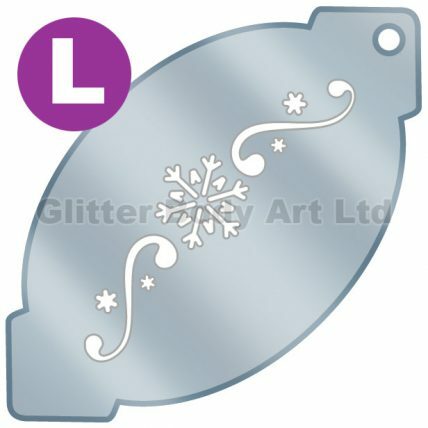 Snowflake Band – large airbrushing / facepainting stencil. Our LARGE Facepainting / Airbrushing Stencils are made of flexible hard-wearing plastic which are non-adhesive, re-useable and washable. Our stencils are perfect for creating larger designs and quick and easy to apply. Using a sponge apply your face paint over the stencil which will leave you with a beautifully detailed design. These stencils are designed to be used with face paints and a sponge or airbrushing. There is a hole in the end of each stencil so you can attach them to a keyring for ease of keeping them together.